Wide choice of attachments for different applications to maximise machine versatility. An exceptionally wide door , opens 180° and is constructed in two sections to unable the upper section to be opened independently from the lower one. Both door sections may be secured at the fully open position for operator safety and convenience. Outstanding operator comfort and confidence for increased daily production. The elegant and wide cab is more than a working post. The instruments and controls are ergonomically located to ensure unbeatable comfort and safety. The cab internal surfaces are coated with ABS plastic for quick, easy and effective cleaning. The standard, continuously adjustable, tilting steering column grants a full range of operator adjustments to provide his most suitable driving position. 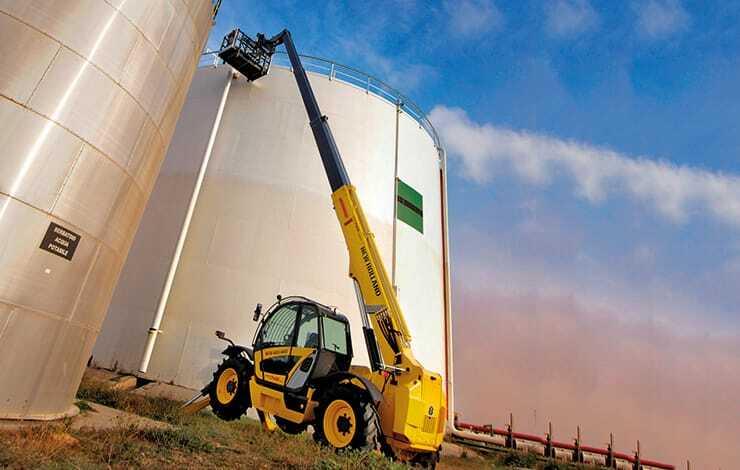 New Holland Telehandlers, feature a single lever multifunction manipulator. The boom lifting/lowering and the fork or bucket closing/opening are hydraulically controlled by mooving the manipulator respectively back & forth and left & right. The boom extension/retraction is operated, according to the model, by an on/off electrical button or by an electro proportional “rocker”. Exceptionally smooth modulation while changing gear or selecting forward and reverse. Crab steering: to easy clean-up alongside walls or buildings without any complicated manoeuvres.